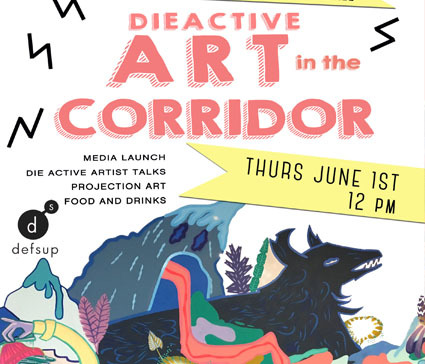 The project is a partnership of Definitely Superior Art Gallery’s Die Active Art Collective and Thunder Bay Public Library to animate the library entrance, while also engaging with young people in creative and meaningful ways. The mural began early in May as an exciting opportunity for emerging artists from the collective to showcase their high-quality and evolving street art aesthetics and techniques to the public, while bringing colour and creativity to the Library and mall. The project partners are confident that this colourful addition to the space will encourage an appreciation for art and the capabilities of youth. A projection time lapse of the artwork and artists was also created during the painting process and will be viewed at the big reveal. Photos of the mural can be seen on the Definitely Superior Art Gallery and Thunder Bay Public Library Facebook pages.